A few years ago, American workwear came to the forefront of men’s fashion, a sort of sartorial resurgence of Americana. Classic cars and classic boots, as well as denim, leather, and white tees, were suddenly ubiquitous in streetwear. The movement wasn’t just a fad; the clothes represent a lifestyle of bucking trends and a return to the hardworking values of the mid-20th century, that American boom time for innovation and greatness. We love the Americana trend and what it represents: pride and patriotism. New York City isn’t exactly known for its spacious skies and amber waves of grain. So, we enlisted Rob McMillen, a/k/a The Blind Barber, to show us how he pulls off classic looks in the big city. 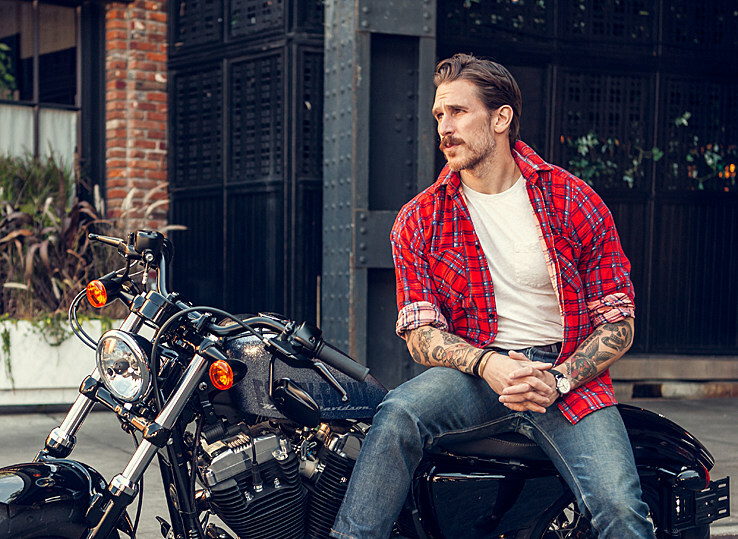 An Ohio native, McMillen’s style adaptation starts with his motorcycle. Instead of a big, impractical chopper, the barber opted for the more streamlined Harley-Davidson Forty-Eight. With a fat front tire and steel peanut tank, the Forty-Eight is a low-slung urban brawler ready to rip through the mean streets of NYC. Below, check out four ways Rob dresses for his Forty-Eight — each item picked from his closet, each look tailor-made for life in a city of eight million people. Wasting too much time worrying about an outfit during the beginning of your day can throw off your entire schedule. Grab a versatile flannel to fight off the crisp autumn chill and hit the road. You have things to do. A clean T-shirt and jeans is the quintessential outfit for a midday caffeine break. Pro tip: Scout your local thrift shop for vintage tees with graphic prints for a unique touch. Hitting the gym directly after work leaves no time to spare. Throw on those sneakers for that quick mile ride and save yourself the hassle of stepping in and out of work boots at the gym. Upscale attire would look out of place on a chromed-out hog, but this peacoat over indigo denim works perfectly on top of the sleek and streamlined Harley-Davidson Forty-Eight.